An exercise band, or resistance band, adds impedance to any pushing or pulling exercise designed to strengthen or tone a muscle. As the athlete stretches the band, the tension increases in both the band and the muscles. Several types of workouts involve the use of an exercise band. 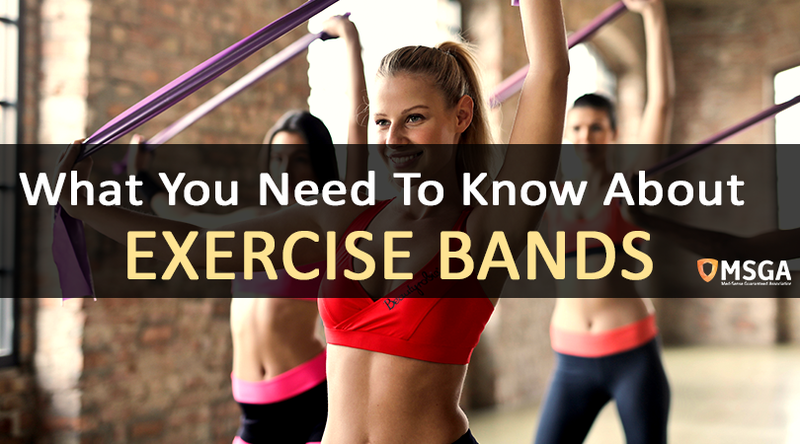 How Does an Exercise Band Differ from Using Weights? Free weights provide constant resistance, which is an equal amount of load resistance dictated by gravity throughout each repetition in an exercise. Thus, a 50-pound weight will always provide 50 pounds of resistance throughout the pull or push cycle. By contrast, exercise bands provide gradual or progressive resistance, which is continuously increasing resistance that peaks until the athlete releases the tension or completes the full range of motion. A strength curve illustrates how much kinetic force the body can generate at joint angles through a range of motion. The curve accounts for all points in the range (beginning, middle or peak, and end). By creating progressive resistance, an exercise band adds more resistance at the strongest point or the peak in the range of motion while providing appropriate resistance at other points in the range. Thus, it stimulates the muscles by offering the right amount of tension throughout the range. When utilizing an exercise band, users must move beyond their general understanding of the tool. They must learn how the band improves muscle performance in the concentric and eccentric phases, the sticking point, and end-of-range movement of an exercise. During the concentric phase part of an exercise, the muscle contracts and shortens. For example, the concentric phase occurs during the upward motion of a bench press, biceps curl, or squat where tension is at its highest. During the concentric phase, elastic energy is stored, and the band improves the concentric part of the exercise. Every exercise has a weak point in the range of motion known as the sticking point. This is the portion of the exercise where the joints demonstrate their weakest position. Thus, the entire exercise is weakened by the sticking point. Since exercise bands optimize strength training at any given point during the movement, the bands will improve the athlete’s ability to overcome the weakness. Athletes use elastic bands to increase strength toward the end range of the movement, which is the portion of the exercise where the band provides the most substantial resistance. Increase in resistance also increases the need for a stronger muscular response and higher production of energy. The result is a higher output of muscular strength over time. The eccentric phase of a lift occurs when a muscle contracts while lengthening. For example, it is the downward motion of a bench press, biceps curl, or squat. During this phase, the band moves from creating resistance to providing assistance during the downward motion. There is an increase in muscle movement during the eccentric phase when the athlete uses the exercise band to assist in the downward motion. Consequently, the increase in activity boosts the rate of assistance from the band. Before using exercise bands, athletes should engage in warm-up exercises or stretches for five to ten minutes. Warm-ups will prepare the muscles for resistance training and help athletes avoid injuries. All exercises should be executed with absolute precision and control. The user should maintain proper posture. With correct use, athletes should notice an improvement in performance by adding the exercise band to their arsenal of athletic equipment.